Keeping its theme consistent, SuperLenny —through its character, the man-deer “Lenny”— expresses its desire to “keep friends close” by coming up with a mobile app that keeps members in contact with Lenny wherever they may be. The appearance of the app is pleasing to the eyes with its black and yellow colour theme which is consistent with that of the desktop version. The layout is mobile optimised, and the platform as a whole is easy to navigate. “APK” stands for “Android Package Kit,” which is the file format that the Android operating system utilises to install and distribute mobile applications. You can think of it as the Android equivalent of the “.exe” files that you use to install software on computers that run on the Windows operating system. If you look for SuperLenny in the Google Play Store, unfortunately, you won’t be able to find any Android app there. Nevertheless, if you want to use SuperLenny mobile services, you can do so by using the mobile site version. It looks sleek and professional so that you will love it. Of course, Lenny wouldn’t want his friends using iOS to the left out of the fun, so there is also a version of the app specifically for iOS systems. The SuperLenny app for iOS devices is pretty much like the replicate of the app for Android devices, but the former specially designed for Apple mobile devices. The design and layout are the same, and the UX is just of the same level. The offers are also just similar. Step 1: To download the SuperLenny app for iOS systems, iPhone users will also need to visit this page. Step 2: After scrolling through the information about the mobile casino and sportsbook, users will find the yellow button with “Download for iOS”. Step 3: They can simply click on this yellow button to download the app version for their phones and tablets. iOS users can also download the SuperLenny app from the App Store. They merely have to open their iOS device’s App Store, search for the SuperLenny app, and install the app on their iOS mobile device. Fulfilling its promise of an exciting ride, SuperLenny lets mobile app users enjoy the thrill of the full Sportsbook just like regular desktop users would. Mobile users can watch their favourite teams, support them in the big games, and bet on their victory while the game is going on. Fans can choose to bet on a wide array of games such as Football, Water Polo, Boxing, Squash, Rugby, Volleyball, and Ice Hockey. Expectedly, the sport with the most number of markets is Football. The odds are also reasonable. The mobile sportsbook features an easy-to-navigate design. Users will find it quite easy to access and take advantage of SuperLenny’s great odds as well as markets while playing on their smartphones or tablets. If you would like to see the stats of the different leagues and teams, just click on the “Statistics” tab on top of the page. The creators of SuperLenny’s mobile apps have taken the utmost care to squeeze everything that makes SuperLenny so great into this more compact package. With this, the mobile app also offers users a choice from over 700 fun slot games with an addition of at least 40 games on the live casino. All that is needed to enjoy it is a stable data connection with decent speeds and a tablet or smartphone that supports the app. This feature highly appreciated by sports bettors. The in-play option gives real-time odds and markets on which you can bet anytime. There are different sporting events. Also, there are live statistics and information about the game which updated in real time. With it, you can bet on the go whether you use the mobile app or website version of SuperLenny. If you have experience with the new online betting on sports, you should have heard about the cash out option. It gives you the chance to close your bets earlier. With this, you can minimise your losses or get an instant profit. Although the option is available at SuperLenny, it can’t find at all events and markets. However, it is available for the main sports events and betting options. Another good feature of SuperLenny mobile is the live casino section where players can play the most popular casino games with real-time video. It is in high quality, and it is compatible with your mobile device. Alongside the video players will have an interactive platform to make their bets in the game. With this option, you can take the casino atmosphere wherever you are. SuperLenny’s mobile site can easily access without the need to download anything. The user goes to the casino page, and then he/she will be redirected automatically to the mobile casino. Most of SuperLenny’s promotions can be availed of by both online and mobile users, though there are also deals which are made especially for clients on mobile. With rapid improvements in technology and faster connections, the mobile casino experience gets better and better. Just as in the online casino, users of the mobile version will need to register and create an account to be able to play with real money. Once registered on mobile, the user can then make a deposit and avail of a welcome bonus of a certain amount of bonus funds, and sometimes, also with free spins. It would be wise to check though if these bonuses would also be available on mobile for your favourite game because certain games have different versions for PC and mobile. For those who want to play for the sake of enjoying the games, they have the option of playing SuperLenny’s slots in “fun” mode. “Fun” mode players will get virtual credits that they can use to test the game on their mobile. However, should there be winnings, they are also just for fun and cannot withdraw. Users can enjoy the gaming and betting experience on the go with the streamlined, easy-to-navigate design that makes the original site so appealing. SuperLenny utilizes software from Net Entertainment with added slots games provided by Playtech, Play ‘N’ Go, NYX Interaction, and Microgaming. It also features instant play casinos from WMS and Ash. Its lineup of table games is quite impressive, featuring a good mix of roulette, blackjack, and other casino games that are not so common, such as Six Shooter, Mah Jong Exchange, and Odd One In. Casual players can opt to play most of SuperLenny’s table and card games just for fun and enjoy the great graphics. Players who want to learn to improve their playing can choose games from Red Tiger that have an optional tutorial feature that will guide players on how to best play each hand that comes up. They also offer an attractive range of stakes that will satisfy most players’ budgets. Their strongest suit, however, is the huge slots section, which can be easily accessed on desktop or mobile. This is followed by their live dealer games that allow players to converse with the dealer and each other. Newly-registered “friends” of Lenny get a bonus that can be as high as 100% (up to £50). They can also enjoy up to 50 Starburst spins on the house. To activate the bonus, the new user will need to deposit a minimum of €20. To use the bonus, users must meet the wagering requirements. The deposit bonus carries with it a requirement of 30x (bonus + deposit) while the free spin winnings require a 5x triggering deposit. Regular players rewarded with BUX for their loyalty. BUX are essential points that players earn by completing tasks assigned by Lenny. These can exchange for bonuses or free spins. Just like any other mobile app, SuperLenny’s mobile app has compatibility and system requirements of its own. For Android, your device should have an OS version of 4.0.X or higher. For iOS, your Apple mobile device should have an iOS version of 8.0 or higher. 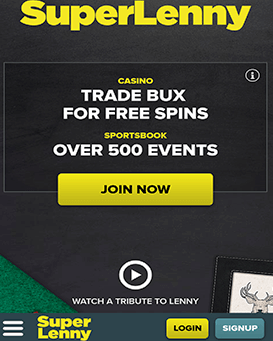 SuperLenny.com is an online casino and sports booking site that is operated by BetIt Operations, Ltd. It was created in 2014 and is registered and regulated by the Malta Gaming Authority (MGA) as well as the Gambling Commission of Great Britain. The Sportsbook section of SuperLenny is operated by MT Secure Trade Limited which is also based in Malta and is MGA-regulated. SuperLenny has two sister casinos, Thrills and Kaboo. All three casinos run using the Every matrix platform. To Ensure the players’ enjoyment, and the site offers games from big software providers such as NetEnt, Microgaming, Play ‘n’ Go, and Nyx Interactive. It is also equipped with the latest SSL encryption technology to keep players’ details safe from cyber thugs. SuperLenny is easy to distinguish from other casino sites. It has a clean, crisp, and professional-looking design that features a central character—Lenny himself. Lenny portrayed as a mysterious tuxedo-clad male figure with the head of a deer who is always “in the know,” and whose legendary exploits promise a thrilling and exciting friendship to new users. Witty quotes from (and about) Lenny are sprinkled all over the site, creating a consistent feel and friendly vibe. If you have questions that need answers, use the FAQs below as your guide. How is a deposit made via mobile? You have to log into your account first. Then look for the “Deposit” button on your homepage, at the top right portion. Click on this button then select the deposit method you will be using. Afterwards, enter your deposit amount. If I win from the free spins, can I withdraw my winnings using mobile device right away? No, any winnings that you get from your free spins cannot withdraw immediately. You have to wager them again for at least twenty times before you can withdraw. Free spins can use in Gold Lab, Northern Sky, and Second Strike. What is a mobile reload bonus? A reload bonus is a reward that you get when you make your deposits via payment methods other than Paysafecard, Skrill, or Neteller. Essentially, it is like a discount because you will receive more funds that you can use to play. It is subject to wagering requirements, so the bonus should be wagered per the requirements. Otherwise, the bonus (as well as any winnings from the offer) will be forfeited after seven days. Reload bonuses are offered to players through SMS, phone, or onsite notifications and can use for a lot of games. Are all new members eligible for the first deposit mobile bonus? No, there are countries in which players are not allowed to receive this bonus. Among these are those from USA, Ukraine, Turkey, Thailand, Spain, Portugal, Slovenia, Slovakia, Russia, Romania, Poland, Pakistan, Montenegro, Moldova, Mauritius, Lithuania, Latvia, Italy, Indonesia, India, Hungary, Greece, Georgia, France, Estonia, Denmark, Croatia, China, Czech Republic, Bulgaria, and Bosnia & Herzegovina. If you are from Great Britain, you should get in touch with customer services right away through LiveChat or send an email to support-en@superlenny.com. Within 24 hours, you can expect an email from the company to acknowledge the company’s receipt of the complaint and to verify any details. For fairly simple issues, your complaint should address within five working days from the company’s receipt of it. However, for more complicated problems, the company will advise you when they can give a final reply. What do I do if the funds in my account suddenly increase without me making a deposit or winning anything? Should there be any errors in the crediting of funds, you must immediately inform the company and repay the full amount that wrongly credited to your account. Can I use the mobile platform anywhere I am in the world? Some countries restrict the use of gambling applications, so you will not be able to access SuperLenny’s mobile app and site version from there. Does SuperLenny mobile have an affiliate program? Yes, SuperLenny has an affiliate program under gigaffiliates.com. This program allows affiliates to exclusive access to SuperLenny’s tools, banners and support, media and marketing kits, and lets them earn from it as much as they possibly can. SuperLenny’s well thought-out website design, along with its cohesive theme and attractive layout, greatly adds to the player’s overall casino experience. That complemented by a wide range of game offerings and speedy customer service, which further boosts its stable positioning. While there are a few minor details that could be improved overall SuperLenny offers a solid, enjoyable casino and sports betting experience and gets an 8 out of 10.